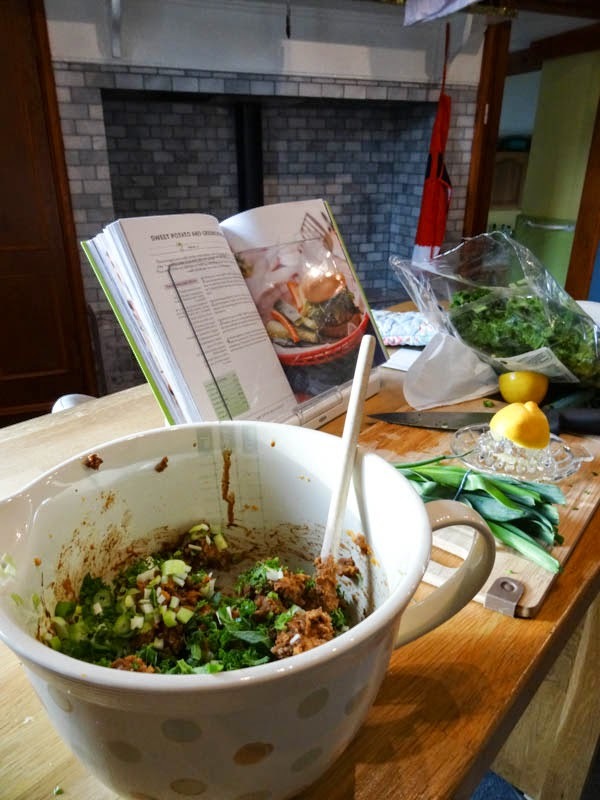 Jessica Nadel's blog, cupcakesandkale and Facebook page will be well known to vegetarian and vegan cooks and now Jessica has had a book published, Greens 24/7: Delicious Recipes for Green Veg at Every Meal. 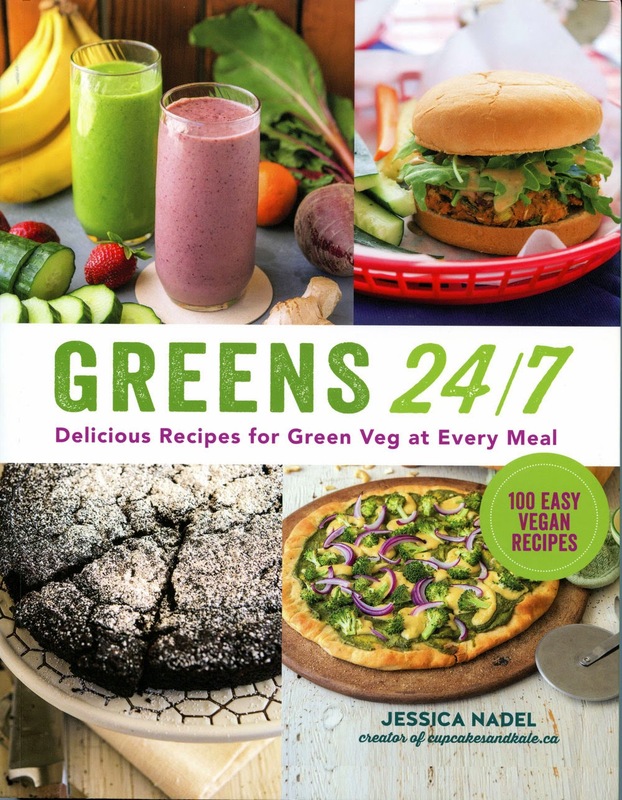 Greens 24/7 has more than 100 quick and easy recipes for turning leafy greens into delicious vegan meals, snacks, smoothers and cakes as well as nutritional information, and helpful ingredient factfiles. Jessica Nadel is a freelance writer and blogger at Cupcakes and Kale, she is also the owner and baker at Oh My Bakeshop, a natural organic bakery. Introducing Greens - Jessica admits, that like most kids she didn't really like greens, however she changed her mind once she was shopping and cooking for herself and found creative ways to cook and serve them. Jessica is on a mission to get us cooking and eating some of the more unusual greens as well as those we are familiar with. Green Fact Files - Here you learn all about the different greens, which vitamins and minerals they contain and a mini index of recipes in the book containing each different type of green vegetable. The most popular greens get a little 'recipe card' style entry and then there are a couple of pages information about 'other greens'. This is followed by a sort of glossary of other ingredients used in the book with which you may not be familiar. Typical Day Green Menu Plan - Jessica has helpfully put together some menus using the recipes in the book, each day has a recipe for breakfast, lunch, snack, dinner and dessert. Smoothies and Breakfasts presents a wide range of smoothies including Chocolate Superfood Smoothie, Lemon Ginger and Parsley Smoothie and Hello Sunshine Smoothie. I really liked the sound of Cinnamon and Courgette Waffles, Kale and Herb Cornbread Muffins and Breakfast Sandwich with Avocado and Rocket. Green Sides and Small Bites contains some really fun, simple to make recipes including Cucumber Pesto Canapes, Pesto Polenta Fries with Aioli, Dandelion Colcannon, Spicy Garlic Bok Choy and Kale and Walnut Pesto (which seems to feature in quite a few other recipes). Green Main Meals is absolutely packed full of great ideas for green dinners, the following recipes particularly caught my attention. Spicy Peanut Noodle Bowl, Orichette with Chard, Sundried Tomatoes and Toasted Almonds, Stuffed Baked Sweet Potatoes with Broccoli, Swiss Chard and Hummus and Sweet Potato and Greens Burger which I chose to make for this review. Green Cakes and Desserts, who knew there were so many ways to green up the sweet stuff? You can feast on Chocolate Dipped Kale Crisps, Chocolate Hazelnut and Avocado Tart, Avocado and Kiwi Iced Birthday Cake, Lemon and Parsley Olive Oil Cake and Vanilla Mint 'Cheesecake'. There are a couple of beverages to wash down all this green goodness Sage and Lavender Tea and Dandelion Mimosas. Who is it for? Vegetarians, vegans and anyone who wants to eat less meat and more green vegetables. The recipes are interesting and varied, they are also well laid out with the ingredients on the left and instructions on the right. I liked that each recipe included nutritional information, very nicely done. The photographs are good although not every recipe is accompanied by a photo, I was more attracted to read the recipes that did have a photo. Cons - this is one of those very annoying books which won't sit open flat. I used my cook book stand to hold it open when I was cooking, but I can see that the spine wouldn't last long as you are forcing it to lie flat. Many of the greens are easily available but I felt this book would be more useful in late spring and summer when most green things (other than cabbage and kale) are in season. The jury is out on this book, I'm not Vegan or Vegetarian although I do enjoy meat free recipes and I really like greens, I think what is holding me back here is the availability of different types of greens so I'm going to hang on to the book and have another go when the weather is warmer and there is more variety of green things for me to use in the recipes. 1. Preheat the oven to 200C (400F). Skewer the potato with afork several times and place in a suitable dish. Bake for an hour or until fork-tender. Remove from the oven and allow to cool for 5 minutes before peeling and mashing the potato in a large bowl. 2. Add the pinto beans to the bowl and mash them in too, then add the greens, onions, oats Worcestershire sauce, umeboshi viengar and seasoning and mix to combine. Refrigerate for 30 minutes. 3. Reheat the oven to 200C (400F). Form the mixture inot four burgers, place on a baking sheet and cook for 0 minutes, then flip over and bake for another 15 minutes. If desired you can then pan fry them for 2-3 mintues on each side. 4. Whisk together the tahini, tamari, lemon juice and a pinch of sea salt until smotth. Thin out with a little water to the desired consistency, if necessary. Serve the burgers on the buns, topped with the lmon tahini suace and sprouts or rocket. I couldn't get the greens mentioned in January, so used kale but wilted it with a little water before chopping. How were the Sweet Potato and Greens Burgers? The texture of the burgers is quite soft, I baked them in the oven the day before serving, cooled and refrigerated over night. Before serving I reheated the burgers by frying in a little vegetable oil which gave a nice crispy outside. 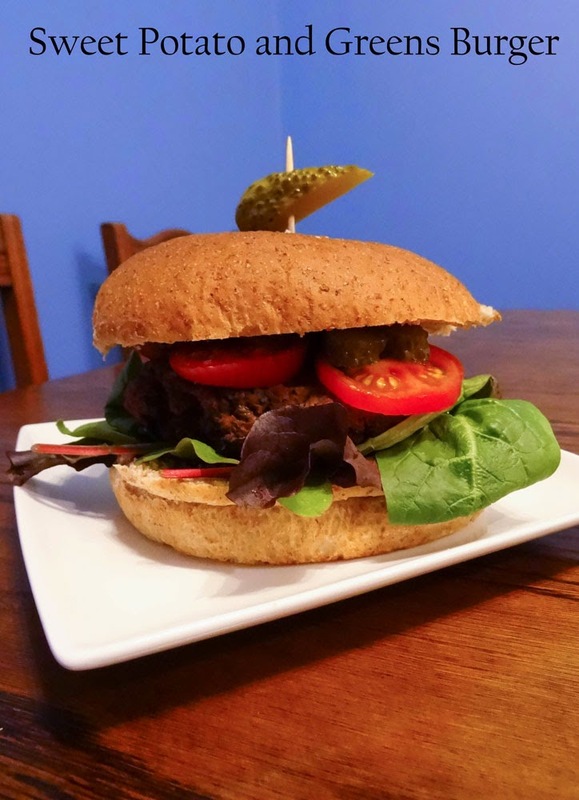 The flavour is very good and the greens had melted into the beany burgers without trace! We really enjoyed them and I would definitely make this recipe again. I have one copy of Greens 24/7 to give away, follow the instructions on the Rafflecopter widget to enter. this looks like a really decent and thick veggie burger. So many people get it wrong but yours just looks so wonderful and nourishing and moreish. YES PLEASE! That veggie burger looks like something I'd be very happy to sink my teeth into Janice. And yes please to greens. I never quite feel right if a day passes without having eaten something green (fast days aside). Avocados in cakes I'm now accustomed too, but parsley is a new one for me - intriguing. I'm a vegetarian greens lover so every day they get a new treatment: plainly steamed, roasted with a spritz of olive oil and herbs, in a stir fry, on a homemade pizza, as crudites - the list is endless. Microwaved and served with meat, potatoes etc until now.I have bought a juicer this week and tomorrow I am planning to buy fresh green vegetables to juice.